Postcard US-2558458 from Illinois shows the Navy Pier, a 3,300-foot 1,010-meter long pier on the Chicago shoreline of Lake Michigan, with the skyline of the Streeterville neighborhood of the Near North Side community area in the background. Built in 1916 primarily as a cargo facility for lake freighters and passenger excursion steamers, the pier today is Chicago's number one tourist attraction that hosts the Chicago Children's Museum and an IMAX theater. It was added to the U.S. National Register of Historic Places on September 13, 1979. In the news today, winning over the competitions from Columbia University in New York City, the University of Hawaii in Honolulu, and the University of Illinois at Chicago, University of Chicago will host the Obama Library, Museum and Presidential Center on Chicago’s South Side, located in either Washington Park or Jackson Park. 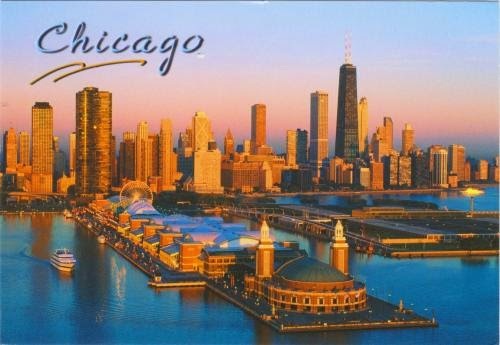 Compared to the downtown area shown on the postcard, the South Side of Chicago has great disparity in income and other demographic measures, and a reputation for being poor or crime-infested, The Obama Library will not only honor the legacy of the first African American president in the U.S. who had worked at University of Chicago's Hyde Park campus, but also give an enormous economic boost for the South Side.